Wanna kick your cookies up a notch? Are you tired of *just* making decorated cookies? Wanna take cookie decorating to the next level? Let me introduce you to Julia Usher. You may know her from the book Cookie Swap. 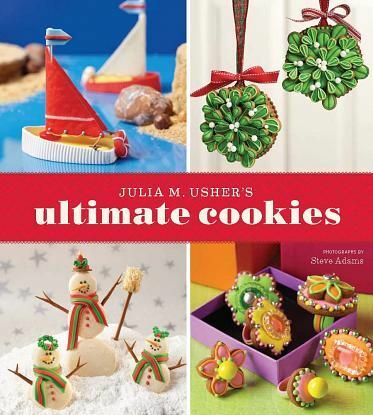 Well, Julia has a new book called Ultimate Cookies...and let me tell you, the cookie projects in here might just blow your mind. These are not your everyday cookies. These are cookie projects that will impress even your mother-in-law. Julia explains the how-to's in detail...and her cookies are flawless and perfect in every way. I'm going to call her "Cookie Ninja." Ultimate Cookies isn't officially out yet (although, you can pre-order it), but guess what? You can win a copy! leave a comment on this post telling me your current favorite cookbook. One random winner will be chosen on October 20th at 8pm CST. I LOVE The Whimsical Bakehouse by Hansen and Hansen. They have a great recipe for chocolate chip poundcake that I turned into Lego blocks for my son's 5th birthday cake! I honestly do not have a favorite cookbook, but I do have a favorite decorating book. Hello! Cupcake and What's New Cupcake? are my two favorite cupcake books. I also love Bakerella's cake pop book. I have a couple of cookie books that I need to pull out and play with. Wow, those are amazing cookies! I have so many favorite beautiful cookbooks, but the book I use most often is "C is For Cooking- Recipes From The Street"
oh my word! Those are unreal! I don't really use books except the ones my mom and aunt made for me, so I have to say those. My favorite Cookbook right now is The Big Book of Cupcakes. Although I use a lot of family recipes. Wow! What fabulous looking cookies! My current favorite cookie cookbook is The Art of Making Good Cookies. I believe it was published in the 1960's. Love these designs! Flawless. My favorite is also Hello Cupcake!. Cake Pops by Bakerella and my family cookbook. The pictures leave me almost speechless! My favorite cookbooks are Taste of Home, and then there's River Road, and then....well, can I just say I love cookbooks even though I probably have more than the law allows. It would be great if I could have a copy of this book at least for inspiration! My favorite cookbook is a realy ol one, bought at a used books store, sponsored by a famous sugar brand. I can't pick just one! But the ones I like the most are the cookbooks that churches and local organizations put together. A lot of those recipes have been in families for generations so you know they're tried and true! Wow those cookies are amazing. My favorite cookbook right now is Hello Cupcakes! There are a ton of great ideas in the book! Sadly, I don't have a favorite cookbook, because I don't have one! All I have are recipes handwritten by my mom and grandma (and me, in a couple of cases) on little note cards, tucked away in a drawer. I'd love to have that book, though. Baking cookies is my favorite past time, and those cookies are just gorgeous! Those are so insanely detailed, I'm having a hard time believing they're really cookies. The Joy of Cooking has been helpful to me over the years. I don't really have a favorite cookbook at the moment (although I do adore The Unofficial Harry Potter Cookbook int the fall) because I have been trying lots of new things from Pinterest! wow, her new cookbook is STUNNING! 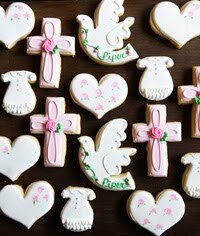 one of my favorite things to do is decorate cookies, and I would absolutely LOVE to have this book! my current favorite is Ad Hoc at Home - although so far I am enjoying reading it, no cooking yet! My favorite one is "Tried and True" recipes from my church. I know the contributors and if I have a quetion, I can just call them up. I would love to add yours to my favs. I sure hope I win. Thanks for the opportunity. My favorite cookbook is my America's Test Kitchen family cookbook. It's my go to for everything. But this one looks so awesome! I have too many favorite cookbooks to list! My newest is Zombie Cupcakes... love it! I don't have just one, but I have stolen my husband's grandmother's old 1960s cook books and am working my way through them!! Gosh what a feast for the eyes !! One can only aspire for this kind of perfection. My current favorite cook book is called "Death by Chocolate" Need I say more ? The Pastry Queen! Love it! Since I started working again, I've been using Stephanie O'Dea's 'Make it Fast, Cook it Slow' cookbook. It's fabulous, full of delicious crockpot recipes. Mine is actually a homemade one. Instead of a wedding shower when I got married 3 years ago...my bridesmaids made a cookbook for me. They emailed/called all my relatives and friends and asked them to send their favorite recipes. Then they printed it in a spiral bound adorable book with a picture of me and my husband on the front, and it says "Eat, Drink, and Be Married". How cute is that? And the best part is all the recipes inside are tried and true so they are like pre-reviewed! Since I can't choose just one, I'm going to say the entire Williams-Sonoma cookbook series. I only own two cookbooks, I use the internet for all my recipes instead. I love my Better Homes and Gardens Cookbook though. So many, many recipes. This one looks AMAZING! The Barefoot Contessa cookbook! yummy! I dont have a specific favorite. I use a couple of homemade cookbooks from preschool, I use the app epicurious, and all of the other cookbooks on my shelf! I am more into the decorating books now. My old Betty Crocker...but I LOVE to peruse the internet for recipes and ideas! Right now my favorite cookbook is actually the food network magazine....I sit and look at the pictures & my mouth waters and I never make any of the stuff because it involves way too much time & energy....but dream about someday when I might get the energy!! Honestly, some of my favorite recipes come from our old church cookbooks. These wonderful women I've known and loved my entire life truly do know how to cook it up! I tend to favor Italian cuisine so my current go to cookbook is The Glorious Pasta of Italy, which I happened to have won in a contest right after I returned from a 10 day trip to Italy! Buon appetito! I recently got rid of most of my cookbook collection because I rely so much on the internet for recipes. I love reading reviews and comments before I try a recipe, so I rely heavily on allrecipes and similar sites when I am looking for something new to try. I do occasionally go back to my Taste of Home annual cookbooks, though. Oh My GOODNESS! That is amazing! My entry cookbook: Company's coming one pot. I love that series, and I find the recipes easy for supper ideas. My favorite cookbook of the moment is Zombie Cupcakes. 'Tis the season! What a beautiful looking book! Amazing! I use AllRecipes.com for most of my recipes (I use the app on my iPad), but for my go to print cookbook, I use the Bridal Edition of Betty Crocker's Cookbook I got as a gift when I got married. It's got many basic recipes and reference material in it that I flip to whenever I have a question or need some inspiration. Those cookies are amazing! I don't know if I'm good enough to make that level of cookie art, but I'd sure like to try! :) My favorite cookbook is La Vera Cucina Italiana because it was sent to me by a lovely Italian friend who wanted me to be able to recreate some of the wonderful meals we had together in Venice. When I'm not baking sugar cookies, I love to bake out of Lisa Yockelson's Baking By Flavor. It's organized by flavor categories, which is so fun! I don't actually own a cookbook. The only recipes I use are from family. I would love a cookie cookbook! I would love to win a copy of this book! :) My current favorite cookbook is French Classic Made Easy. Delicious and practical recipes and tips in this cookbook. 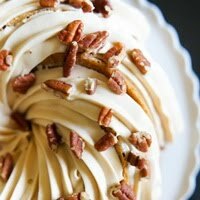 My current favorite is Pioneer Woman's. The cookies in that book are AMAZING! What talent she has! My current favorite cookbook is a Hershey 101 Cookie Cookbook. My mom bought it for me for Christmas one year and it is BY FAR the most used cookbook in my house! My current favorite cookbook is the Weight Watchers 5 Ingredient book - lots of great healthy recipes! Wow! We have "many" favorite cookbooks. Currently, we are loving Taste of Home Cookies - 620 Irresistible Delights! I am loving Paula Deen's Cooking Bible right now. Working my way through "simply dessert!" Totally loving it! The Taste of Home Baking Book. I think my favorite right now has to be Milk and Cookies by Tina Casaceli. I love trying different cookie recipes and each section in her book starts with a cookie base and then adds to it in each different recipe. I love Rebecca Rather's Pastry Queen cookbooks! The Taste of Home Baking Book! my fav is still Pioneer Woman ... but if I cooked from it every single day, my family and I would be 500lbs. I don't have a favorite cookie cookbook, but I love, love, LOVE my "Hello, Cupcake" and "What's New Cupcake" books! I really seem to like the Taste of Home cookbooks, especially their Baking Book. This book looks fabulous - thanks for the heads up of it being published. My long-time favorite cookbook is the Harrowsmith Cookbook which is all reader recipes that were tested in Harrowsmith's kitchen. Thanks for the chance to win the book - I have to know how she does the peacock cookies! I will buy it for that alone. I've recently started cooking my way through one of Rachael Ray's cookbooks, but I think deep down I'm still head over heels for The Flavor Bible. It's not really a cookbook, more of a reference really, but holy smokes is it awesome! I'm such a foodie yet I don't know any cookbook. My mother have a couple but she never bothered to cook with them, nor my grandma ever did. I'm curios as to why they never used but I can't even tell why I never purchased any. I don't necessarily have a favourite cookbook, but I love the Tasty Kitchen website! I've made several dishes and have a whole recipe box of new things to try! I've been hooked on Bakerella's Cake Pops book since my two children love to eat them. We're trying to venture into cookies, and this book would be just awesome! I love the guys at Baked and their cookbooks! 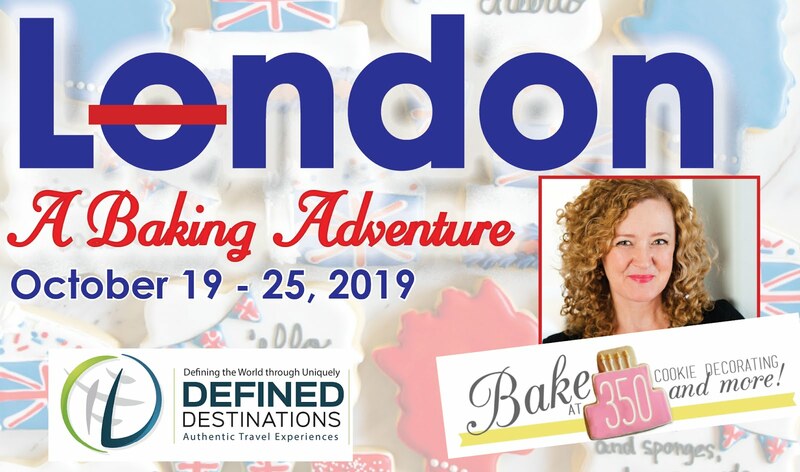 I baked my way through the first one, Baked New Frontiers in Baking and now I'm starting on the second one Baked Explorations. I love their takes on classic desserts!! If I really had to pick just one (because I love each and every single cookbook I have) it would be Crave by Maureen McKeon. It's all chocolate desserts! Yum! 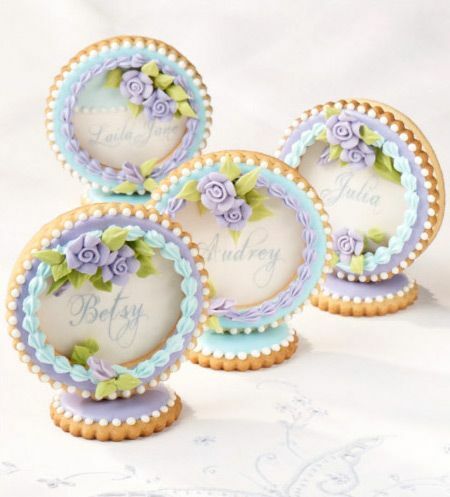 Wow, these are some truly gorgeous cookies. Only one??? I have so many, mostly cakes, cookies and cupcakes. Have to love them! These cookies are wonderful. I hope I win this cookie book. She does amazing work. Amazing! I could never create such works of art. My favorite cookbook is Cooking Light 1998 and the collection of recipes I keep in a 3-ring binder that my mom started my sister and I off with many, many years ago, for my holiday baking. Those few cookies are amazing! My favorite cook book is The Well Decorated Cake...hope i win!!!! Not exactly a cookbook but I just started reading Molecular Gastonomy by Herve This....really interesting so far! Right now, it's Bittman's Food Matters cookbook. I love him, and I love the philosophy, especially coming from a foodie who still wants things to be delicious. My favorite is my paula deen cookbook. The cookbook I've been obsessing over, though it isn't totally cooking-related, is the new Sarabeth's bakery cookbook. Fantastic!!! I love Shirley Corriher's "Bakewise." I've learned so much about the science of baking from reading that book! I just started cooking at a lot when I became a mother last year, and it's opened a whole new world to me! My favorite cookbook that I own right now is Paula Deen's "Bible". Born and raised in Texas, and now living further North - it's helped me stick to my roots. My picky family loves it too! Thank you for the consideration! I really like Flour: Spectacular Recipes from Boston's Flour Bakery + Cafe. So many yummy and fun recipes. I can't think of my favorite cookbook... my husband recently bought me one which was written by a priest, it's a fun read. Sticky Chewy Messy Gooey Treats for Kids. Talk about getting the kids involved in the kitchen! The Chocolate peanut butter pudding in the chocolate cups you make with balloons is pure genius! I have so many that I love but my most recent is "Sugar Baby" by Gesine Bullock Prado. Getting into the "sugar" thing is lots of fun and so far I've had success with everything I've made from the book. omg I love it!!! my fav one is the newest one in slovak language with many delicious cakes! The book looks great!! My favourite book is The Biscuiteers Book of Iced Biscuits!! It's amazing!!! Oh my gosh- those cookies are amazing! I'd love to win a copy, thanks for the chance. I don't really have a favorite cookbook that I use for cooking but I love to get those little ones put together by community groups or churches. Especially older ones- I just think they are the neatest things even if I never end up making anything out of them. I Haven't made anything from a cookbook in awhile. I have been cooking from my favorite blogs. I'd LOVE to win this but i dont ever win anything lol. I dont normally use cook bookes. I dig around on the internet for recipes and tips and collect them in my own book for future reference once tried. My fave cookbook would have to be the old school Better Homes & Gardens one that my mom got when she got married. I do use it - but the internet is my new fave cookbook!! I have to say most of the time my favorite cookbook happens to be the one I am reading at the moment. Yes, I read cookbooks like other people read romance novels. I am currenly reading Baking Style, Art, Craft and Recipies and am LOVING it! I've been making my way through The Joy of Cooking lately. Its very handy! I don't have a favorite cook book but one of my favorite cookie books is Cookie Craft. 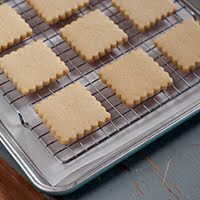 I'm a cookier and would love to see more of the content of Julia Usher's new Ultimate Cookies. 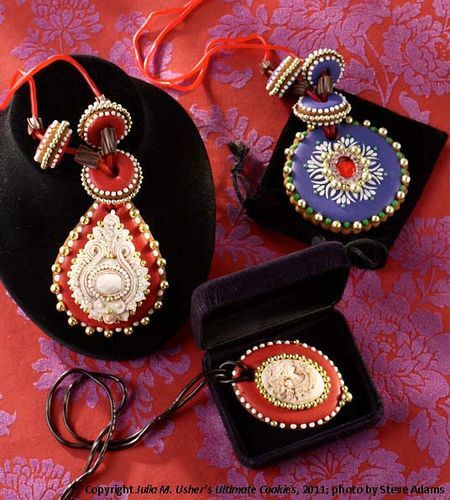 The peacock's are stunning along with the jewelry. Thanks for the opportunity to win this new book. Amazing cookies!!! I cant leave without Jamie Oliver Books...but lately I only go to Nigella's Kitchen! My favorite cookbook for savory foods is The Greens Cookbook. Every dish is always delicious and healthy (and vegetarian). It never disappoints! My current favorite cookbook is Home Made by Yvette van Boven. I think it's really inspiring! My all-time favourite cookbook is Desserts by Bonnie Stern. So much yumminess in that book! Hard to say one favorite cookbook. I love my Southern Living circa 1980's cookbooks for general recipes. The King Arthur Flour All Purpose Baking cookbook is another one of my go-to's. And for cookies I have Martha Stewart Cookies (and it is signed by Martha too). I love THe New Best Recipe Cookbook by America's Test Kitchen. I like to read my cookbooks like books and this one is full of such interesting facts. I love BAke at 350... I decorate cookies often and use this as a learning site. I also love all the suggestions of cookbooks and will have to check out the Taste of Home book. My favorite (tough because I have over 500) is Mad Hungry by Lucinda Scalla Quinn. YUM. For baking cookbooks, I love the BAKED books as well as Sono Bakery book. Thanks for asking this question... I loved reading all the different favorite books and would love to win a copy of this book! 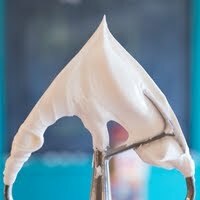 I'm loving the Art and Soul of Baking from Sur La Table lately! I'm loving the Pioneer Woman cookbook right now! Gotta love the good old Joy of Cooking! I don't really have a favorite cookbook at the moment. I've been using with all the fantastic posts on the internet. I have too many favorites. I'm loving Floyd Cardoz cookbook right and Suvir Saran's (all of them). Right now I am reading the New York Times new cookbook like it is a novel. Love it, thanks! Anything by Tyler Florence! He's amazing!! I love my Cooking Light cookbook! I can just flip to any page and find a good recipe! Jamie Oliver's Food Revolution. Not only are the recipes easy and quick, but he shares great cooking tips. These cookies look amazing and even if I don't win, I'll be placing this on xmas list! My favourite cookbook is a classic, Julia Childs The Art of French Cooking. Thanks for the awesome giveaway! I like my hello cupcake books, But most of my everyday cooking comes from kraft.com! I love their easy weekday meals. I have a family cookbook that I've had for the past 6 years that I love! I'm currently obsessed with Hungry Girl cookbooks!! I love eating my fav foods with half the calories. Wowza, those are some fancy cookies! I usually use the interwebs to cull recipes from bloggers I trust. I am currently reading/baking from Mielle, a lovely cookbook with scalloped edges from the bakery of the same name in SF. I have a few cookbooks, but I find myself always going back to the Better Homes and Gardens Red Plaid Cookbook, classic and really good recipes. I would love to win this bookrhe cookies look incredible and sure love to give them a try!! My favorite cookbook includes recipes passed down from my mother and grandmother, and delicious recipes collected over the years. I love recipes that have a story and a history behind them! I also really love the Tupelo Cafe cookbook - Don't have it handy so not sure of the spelling. My favorite cookbook is Pioneer Woman, but my favorite cookie cookbook is Cookie Craft. Love the Pioneer Woman cookbook! I like the Cooks Illustrated annual collections of recipes. My sister-in-law has given them to me for years, and I enjoy them so much! My current favorite cookbook is the compilation of my Grandma's recipes that an aunt put together several years ago. I have a copy of my mom's "Good Housekeeping Cookbook". It's dated June 1956. One thing is for sure there is nothing "lite" about any recipts in this book. We made a cheese cake and it used 5 large packages of cream cheese! One of the best we've had. Those cookies are absolutely beautiful! Currently my favorite cookbook is David Lebovitz's Perfect Scoop. We're ice cream fanatics! That would be my family cookbook. Brown Family Cookbook. Hope to get a sequel soon. 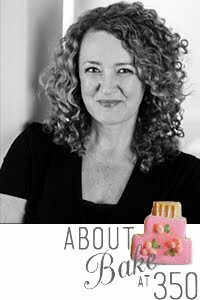 My favortie is Baking for All Occasion by Flo Braker. Best chocolate chip cookie recipe of all time! This cookie book looks like incredible too. Is it wrong that I dont have a favorite cookbook? More often than not I use websites like martha stewart, bhg, epicurious, and even MSN Food for great recipes. I do love Hello Cupcake, 1001 Cookies and Cakes, and Bakerella's Cake Pop books for inspiration though. 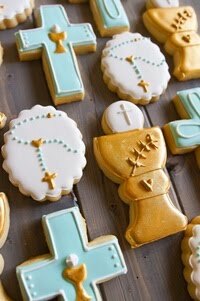 Those are too pretty to eat!!! My favorite cookbook right now is not a book but pinterest.com. I have found some great recipes on there!! My obsession with cookies is rather new so I haven't dived into a sweet book yet but my favorite savory cookbook for inspiration would be the Zuni Cafe cookbook by Judy Rogers. Everything made from that is amazing. I am loving my Mom's old recipe box right now, I miss her very much and making her comfort foods is...comforting! I love cookbooks in general. I am always looking for new ideas to create things for my family. My favorite cookbooks have gorgeous photos for me to look at so that I know what my end product is supposed to look like. I dont have many cook books but the cake bible is a very good book and those cookies projects are truely amaizing. I have several cookbooks, but the one I keep going back to was a bridal shower gift and the most practical thing. I use it so much that pages have fallen out and placed back in out of order, some are taped in place, other pages cannot be opened because food has glued them shut. It is the basic Betty Crocker's New Cookbook, and I just happen to be looking up a recipe in it now as I read your blog! I love, Love Cake Pops, by Bakerella. So many great ideas, so little time! I have been making a lot of candies from Chocolates & confections recently. My coworkers are loving it! Right now my favorite cookbook is Skinny Italian. There are some great pasta dishes for these cool Autumn evenings! I'm currently cooking my way through Gale Gand's Brunch cookbook. Even with all the awesome cookbooks that come out now-a-days, I always find myself going back to the Purity Cookbook. I grew up with one in my house and its where the majority of my childhood cookie recipes hide. Right now, I'm into "Small Batch Baking for Chocolate Lovers" by Debbie Maugans. The small batches are perfect when you don't need the temptation of 3 dozen cookies hanging around, but it's SOOO easy to whip up a dozen or so anytime the mood strikes! My current favorite book is "BAKED New Frontiers in Baking" by Matt Lewis and Renato Poliafito. So far every recipe is delicious! Awesome! I guess my cureent fav is still Pioneer Woman's cookbook, since I'm still finding new things to try in it! My favorite cookbook right now is Pinterest! Okay, I guess that doesn't really count. But I am really liking the World Wide Ward Cookbook by Deanna Buxton. 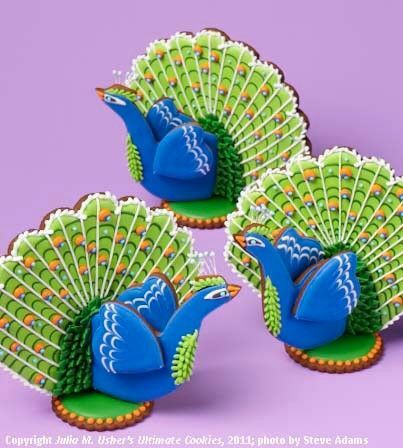 Those peacock cookies are amazing! I have to say that the Settlement Cookbook is still where I go for all the basic recipes. Those are beautiful cookies! I don't really have a favorite cook book. I tend to search and use recipes from online lately! Oh dear me this is such a hard one...I have been collecting for a long time and have over 2000 cookbooks. If I had to only pick one it would be one I have been compiling of my own for years. If it was a published book would be Miette Bakery. Thanks for the chance to win a great book ~ I do have her other and it is an amazing book !! My current favorite cookbook is Ina Garten's Barefoot in Paris. 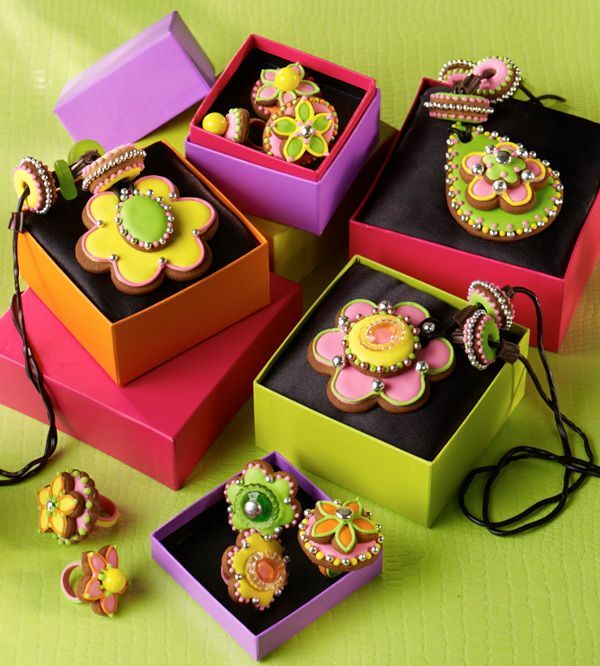 Thesr cookies are amazing, I love the cookie jewelry!!! Those are incredible! My favorite cookbook is my good old red and white Better Homes cookbook from my mom. Big Book of Cupcakes is a great book! I think it rocks!! Those cookies are to die for! My favorite cooks books came from my Mom and Grandma...oh how those women can cook!! Pie in the sky! It has been a lifesaver ever since we moved to Colorado. Wow! Those cookies are spectacular. My favorite cookbook right now is Robert St. John's "Southern Seasons." the fish tacos with three sauces is a taste sensation. My current favorite has to been one of Ina Garten's. Everything she makes is fool-proof. I would love to win this book. It's so beautiful! WOW!!! Well I can honestly say, that I don't have one favorite cookbook. You see I love books and I have many, let me rephrase that dozens of cookbooks. Anything from a church fair cookbook to breads, desserts, candies. I think you see where this is going. So to be able to add another to my collection would be wonderful!! Those cookies are stunning! My favourite cookbook right now is actually my family recipe book. We have an amazing collection of Italian dishes and cookies. YUM! Those cookies are amazing! I can't say that I have a favorite cookbook, but one I'm diving deep into now is Rose Levy Beranbaum's Cake Bible. It's glorious. Wow ... those peacocks are AMAZING!!! I love them but the thought of making them makes me very tired. My current favorite cookie cookbook is Cookie Craft. Although I get most of my ideas now from pintrest, you, and sugarbelle. My favorite cookbook is a cookbook that our church sold like 20 years ago that my grandmother gave me. It has her handwriting in it all over with recipes to try and tips to make recipes better. I love it! My favorite cookbook atm is Bakerella's Cake Pop book. The pictures of all the different cake pops are so cute, creative, and not complicated to make! I received Sarabeth's Bakery: From My Hands to Yours from my husband for my birthday, so it's my current fave. 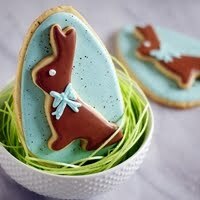 I would LOVE to know how to make beautiful cookies like these though. I often think that the cookbook I happen to be using at the time is my favorite. My favorite cookbook is actually one my parents made for me (and one for each sibling and older grandchildren) . It includes all the family favorites, passed down recipes, and ones we've made up. It's a treasury. I don't use too many cook books, but a lot of websites/blogs. One of my all time favorites in http://budgetbytes.blogspot.com. I love her blog. She has so many yummy things to try. My favorite of he recipes so far in the naan. We make it on a weekly basis to go with some rice and chicken. Yum! I'm addicted to cookbooks! At the moment, probably Martha Stewart Cupcakes.